At Cornerstone we have various midweek community groups which are designed so that we can grow in friendship and in studying the Bible. In order to best serve the whole church family, different groups are at various times throughout the week, some involve different levels of study and some are suitable for families to attend with children. 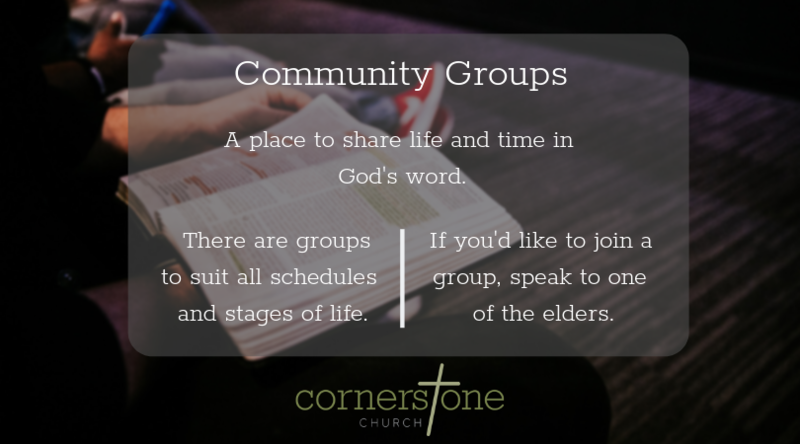 Please to speak to one of the elders if you are interested in joining a community groups. We also have a monthly whole church prayer meeting, we usually takes place on the second Wednesday of each month at 7:30pm in the Cornerstone Centre. Speak to your Community group leader to find out when you group is meeting and check the calendar to see if other events are happening this week and to see what events are coming up.